Welcome to the Cultural Synergies February 2008 newsletter. Happy New Year! As you may or may not know, we have just welcomed in the Year of the Rat. Chinese New Year celebrations began on February 7, 2008 and will continue for 15 days, ending with the Lantern Festival. For me as a child growing up in Malaysia, Chinese New Year was always a time of year that was filled with excitement, the highlight probably being the thrill of setting firecrackers off in the street and eating until we could eat no more! The festival-like mood amongst my family and friends is etched into my memory as a happy time of year. As kids we would visit our Chinese neighbours and even though we weren�t family, they would always include us in their New Year feast and have red pockets of money for my siblings and I. Usually that money was very wisely spent on either firecrackers or sweets! As I reflect on the Chinese New Year celebrations, it reinforces to me just how lucky we are to live in a world that is so diverse. It is easy to forget that not every culture in the world welcomes in the New Year on January 1.st. New Year holds a variety of meanings for different cultures. There are so many different rituals and customs that are celebrated at various times of the year. For example Tet in Vietnam, the Rites of Songkran that are celebrated in Thailand, to Rosh Hashanah, the Jewish New Year. In Australia we tend to focus our thoughts on the year ahead, setting goals and making plans for a better life; while those celebrating the Jewish New Year use this time as one for introspection, looking back on the mistakes of the year just been and making plans to bring about changes and seek reconciliation with the people that may have been wronged during the year. However we celebrate the beginning of a New Year, it is usually an occasion that is celebrated with friends and family who share the same meanings. Although I no longer share Chinese New Year with my Chinese neighbours I do remember them at this time of year with fond memories and appreciate the inclusiveness and generosity that they extended to my family, allowing us to feel a part of the Chinese community at such a significant time. The year of the Rat is said to be one of prosperity and opportunity - Kung Hei Fat Choy! 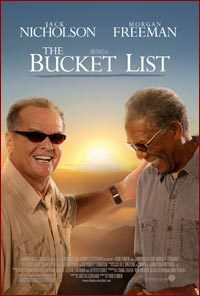 On a trip back from the U.S. this month I saw great film on the plane called �The Bucket List�, starring Jack Nicholson and Morgan Freeman. The film is about a Corporate billionaire Edward Cole (Jack Nicholson) and working class mechanic Carter Chambers (Morgan Freeman) who have nothing in common except for their terminal illnesses. While sharing a hospital room together, they decide to leave it and do all the things that they have ever wanted to do before they die according to their �bucket list� before they �kick the bucket�. �The Bucket� is a film filled with humour and drama that invites reflection on life and the meanings that we give to it.